The Natural Classical Guitar presents a holistic approach with 10 principles that will help you develop yourself as well as your playing. The basic principle is to let nature support you in every way so that your playing is as effortless as possible. Related principles show you how to practice and perform better by settling your mind, relaxing your body, balancing relaxation and activity, and using your mind to guide your fingers. 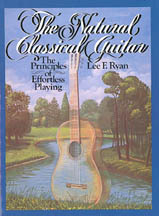 Mr. Ryan's book is excellent and a must-have in my opinion, for anyone that want to improve their Classical Guitar playing ability. Worth it's weight in gold!